Dan Swinhoe (Asia)- Gadget Loving Japan- Sent Via Fax or Smartphone? This week a Japanese company unveiled a four-and-a-half ton robot, capable of cleaning and putting out fires or killing everyone in the room, completely controlled remotely from a smartphone. There's no doubt Japan are world leaders in technology, but the odd thing about that story is very few people in the country would be able to actually control the thing. Despite how into gadgets and tech Japan is, they lag behind on smartphone adoption. There are over 120 million phone subscribers, yet just one in five people own a smartphone. The vast majority still own and use feature phones. While countries such as the UK and South Korea boast 50% and 67% smartphone ownership respectively, Japan's is equal to Mexico. Despite this, people are quickly coming round to the idea of smartphones. The number owning either a smartphone or both smart and feature phones rose by 5% between October and February, showing even if people aren't willing to give up their old phones yet, they are making the transition. There were 23.3 million smartphones sold this year, totaling 56% of total phones sold, according to the MM Research Institute. This year was the first time smartphones actually outsold feature phones in the country, and it's predicted that by the end of 2012, the annual smart phone turnover will expand to 30.5 million and the year after smartphone subscriptions will reach 70 million. In the Apple vs. Samsung battle, the US giant wins. Aided by the release of the iPhone 4S, Apple claim around a third of the market. But in terms of OS, Android claims almost twice the number of devices Quite how the release of the hotly anticipated iPhone 5 (whenever that is) will affect the market is yet to be seen, but it's safe to assume Android will lose ground. While the overall numbers are still low, the Japanese actually engage with their devices comparatively more. This infographic shows that despite having the lowest smartphone penetration in the survey, the country comes out top in 10 of the 18 top phone user categories. Google's own research shows that 77% of people use their smartphone every day and never leave home without it, and over 80% use the internet and email capabilities on them, while the same number multitask with them and other devices. Japanese users are also keen on their apps and mobile videos with an average of 40 apps installed, and 76% using their devices to watch videos. 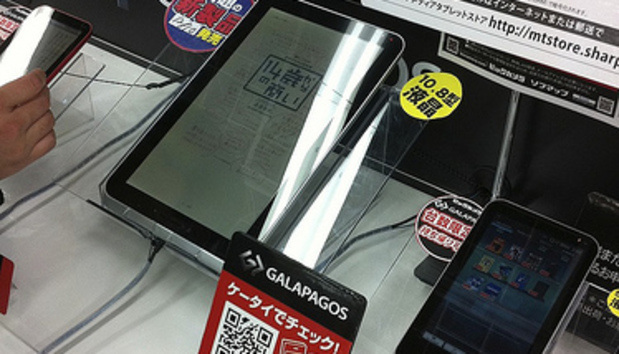 The Japanese are also big on local info and M-Commerce. A quarter look for local information on their phones daily, while half search weekly, 39% have made purchases on their smartphone and 59% of those have made at least one in the last month. The M-market is a healthy sector and only looking to grow further in the future. Despite all this, there doesn't seem to be a real love of the devices. 67% of the Google survey would prefer to use a PC or laptop for most of the services smartphones provide, while just 36% said they would give up their TV for a smartphone. In countries such as China, that figure rose to 54%. Japan's odd relationship with these devices can be tracked back to the early days of mobile phones. In the nineties, while the West was enjoying the magnificent but limited Nokia 3310 et al, Japanese users had big color screens, email, internet access, and a glut of local gadgets and devices that never left its shores. Everyone got used to the devices they already had and the functionality they already possessed. Japan is a country of two halves. One the one side, we see a nation begrudgingly embracing smartphones (while still enjoying the joys of the fax machine- half of households still have and use them), and on the other a country rapidly buying tablets and using the few smartphones they do have to their upmost potential. But overall, in any country where smartphone penetration rises from 5 to 20% in a year, the signs are good that they will inevitably become a major part of the mobile market. And then everyone can control huge robots.